With the eXo Mobile app for Android and iOS, traveling employees can connect securely to your digital workplace with their mobile devices to check for status updates and notifications from their teams and projects or live chat with them even on the go. Any content, such as presentations, brochures, or technical documents, can be searched and previewed from a smartphone or a tablet. This is ideal when visiting customers. 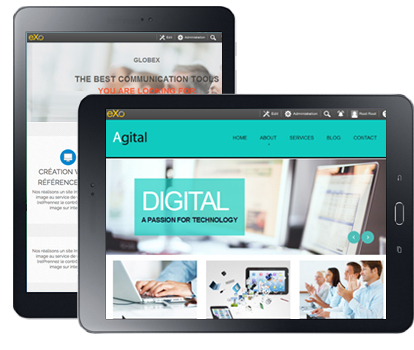 For those who prefer to access their solutions through a mobile web browser, eXo Platform will display just right. 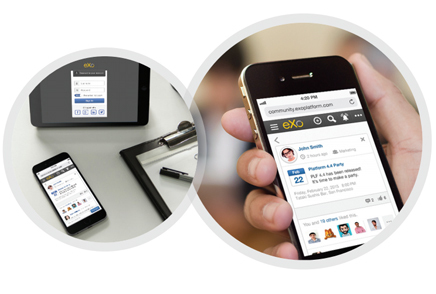 eXo’s built-in apps support mobile web layouts and respond automatically to any form factor smartphones or tablets. 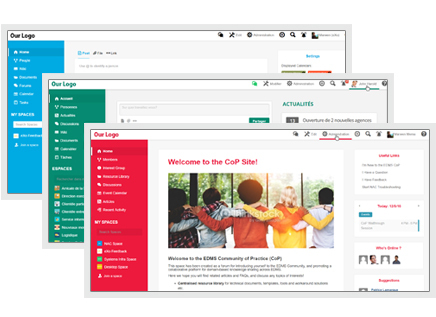 If you want to redefine the mobile user experience, eXo Platform comes with several templates so you can build your own pages or even full mobile-ready websites. 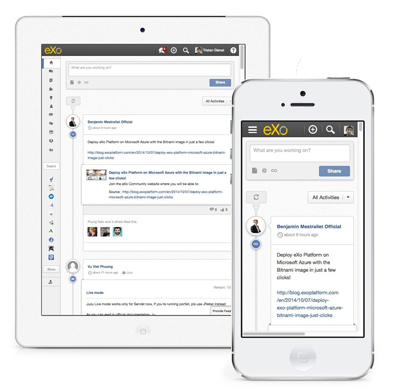 eXo Mobile’s apps are hybrid apps that extensively leverage the responsive layout of the eXo Platform web interface. Hence, any added menus or branding customizations, such as colors and logos, will automatically be accessible to mobile users with no extra effort. And if you want to go further, you can completely white label the eXo Mobile collaboration apps. As with everything we do, the mobile apps are open source so your developers can rebuild them under your name and publish them in your own private enterprise store. Who Benefits the Most from Mobile Collaboration Solutions?